JUST ten minutes of time and one blood test – that’s all it took to save the life of one man. Andrew Edgar, of Benmar Garage and St Michael’s Services in Dumfries, was devastated when his dad passed away from prostate cancer in 2016. And following a blood test, he too was diagnosed with the disease. And now Andrew and nine of his closest male companions – Ross and Ruaridh Edgar, Andrew Rogerson, Alistair, David and Cameron Little, Fraser Crawford, Andrew Forrest and Allen Car- ruthers – are taking part in the Edinburgh Kiltwalk on September 16 to raise money for Prostate Scotland, a cause that is so near and dear to Andrew, who is from Moffat. 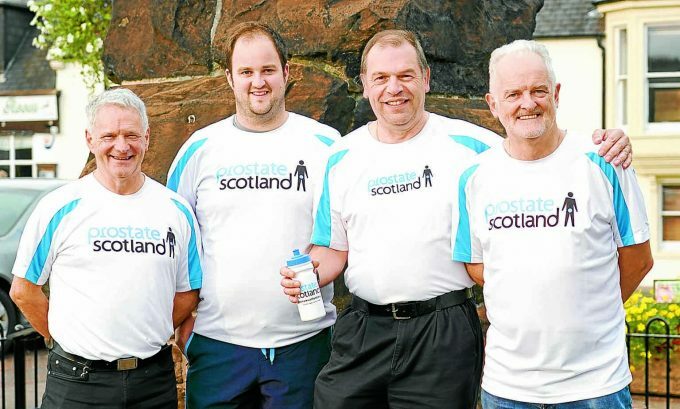 Andrew said: “My main reason for attempting this is to raise awareness of the disease, one in seven men will be affected some time in their life. Andrew and his team of merry men are hoping to raise thou- sands of pounds for the charity, while showing off their kilts, but more than that Andrew is urging his friends and neighbours to get checked out. He has organised a Prostate Scotland awareness talk at the PISC, Moffat, on Thursday September 13 at 7 pm and hopes to see a packed hall.